There's nothing quite like the smell of that first batch of pumpkin bread, baking away on a crisp fall day. The first time it's cool enough outside for the windows to be wide open with a breeze coming in, the first leaves turning orange and yellow and the aroma of autumn spices like cinnamon and nutmeg. 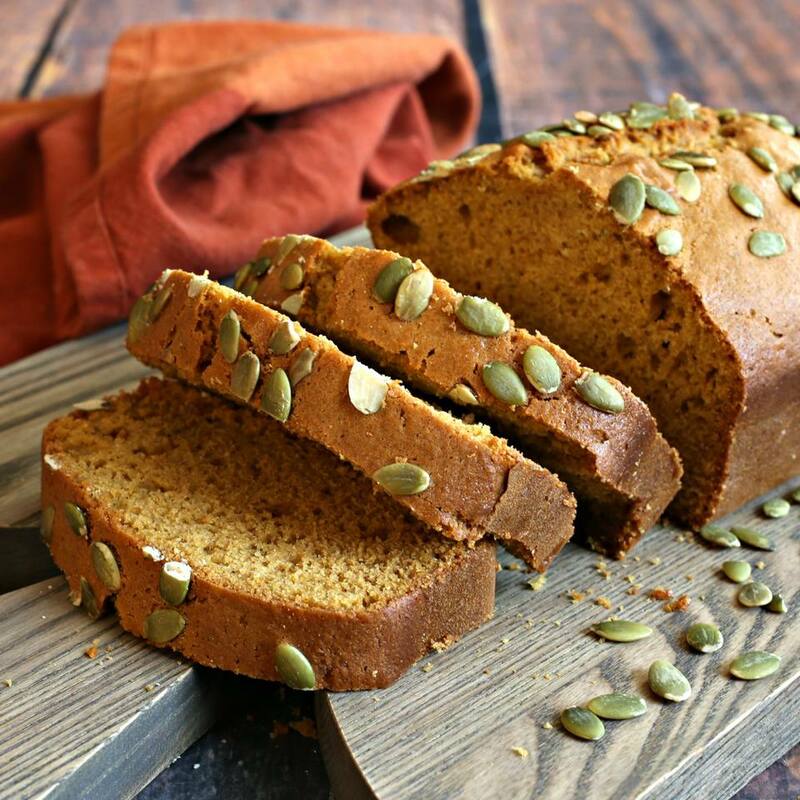 If you're a pumpkin lover, chances are that first batch of sweet bread is only one of many that will be baked throughout the season so there's plenty of time to experiment with different flavor combinations. If you've ever tasted chocolate and pumpkin together, you know it's a perfect match. Likewise, pumpkin and peanut butter marry well. So why not go one step further and add tahini into the pumpkin bread rotation. Tahini is a wonderfully versatile ingredient. Similar to peanut butter, it can be used equally well in both sweet and savory applications. And, in baking, it acts as a fat and adds moisture to help avoid dry baked goods. As sweet treats go, pumpkin is a high fiber, low calorie ingredient. Likewise, sesame paste brings a good dose of added nutrition. Like most nut and seed butters, tahini, which is ground sesame seeds, is high in healthy fat, protein and vitamins. Plus it adds a lovely nutty flavor to the natural sweetness of the pumpkin. And a sprinkling of pumpkin seeds on top gives a satisfying crunch. Enjoy! Pre-heat the oven to 350 F and butter and flour a standard loaf pan. You can also spray it with non stick cooking spray or baking spray (no stick spray with flour in it). Try adding a piece of parchment as well, for easy removal from the pan. Add the eggs and sugar to the bowl of a stand mixer and beat until thoroughly combined. You may also do this in a large bowl with a hand mixer. Add in the canola or vegetable oil, the unsweetened pumpkin puree, tahini, water and vanilla. In a separate bowl, sift together the all purpose flour, salt, baking soda, ground cinnamon, ground nutmeg and ground ginger. Slowly mix the dry ingredients into the wet and pour into the prepared loaf pan. Top with the pumpkin seeds or sesame seeds and bake for 50 to 55 minutes or until a toothpick, inserted in the center, comes out clean. Serve warm with coffee or tea.